VitaMix vs. Blendtec – Which one to Choose? Update: I’ve recently updated my opinion about Blendtec, read below for my updated review. When shopping for your essential raw food kitchen equipment, you’re going to be faced with many choices and decisions. Comparing products can get overwhelming and shopping for new products can get daunting, especially when a considerable investment is required. When it comes to blenders, two of the best blenders on the market are the Vitamix and the Blendtec. Naturally, I am frequently get asked which one I recommend. In this post, I’ll give a brief breakdown between the two blenders as well as my recommendation. Both blenders offer quite a wide price-range of products. For this review I’m going to compare the “average” price point blenders. First off, before I begin, I want to state that both of these blenders are great and are high performance blenders – that’s why they come attached with a hefty price tag. Both these blenders can blend pretty much anything so whichever one you end up choosing, will be a great choice. Here are some other considerations to factor in before buying. My favorite thing about the Vitamix is that it’s got a tamper. You may be wondering why this would be so important, but trust me, it is. The Vitamix lid has a hole that the tamper can go through, but can’t reach the blade. The tamper allows you to move around thick ingredients while it’s on and running. This is a huge time-saving capability. If you don’t have one and you’re blending something really thick you have to constantly keep turning off the blender, opening the lid and using a spoon or spatula to move the ingredients around to try to get it to blend better. This is for a small number of situations, so doesn’t always apply, but when you need it, it’s super handy, like for making vegan cheese or nut butters. This gives the Vitamix a huge advantage. That being said, I’ve recently heard that there’s an after-market tamper for the Blendtec, which means it works for that blender but is not made by the company. The Vitamix blends things foods very fine. I notice how fine the nut pulp is when I’m making nut milks. So it does an excellent job at really creating a smooth fine texture, even if I’m blending hard coconut meat. The blendtec is also great for blending hard ingredients like flax seed into flax meal and making other kinds of flours. One of the reasons I like Blendtec is because it’s definitely got a stronger motor (3+ horsepower, more than any other home blender compared to the Vitamix which has a 2-peak horsepower). When I was working in a raw food restaurant, I used to burn out the motor of the Vita-mix all the time. But never saw that with the Blendtec. That being said, I never used the Blendtec in a commercial food environment. I’ve never burnt out the motor of my Vitamix at home, but I did see it happen when it was under extreme use. The Blendtec also comes with the option of 2 different sizes of container, a 3 qt and a 2 qt. I loved this because I use the blender for so many things and I like to easily be able to interchange them, especially between wet and dry ingredients…which leads me to the next point…the Blendtec is pretty remarkable as a grain mill. Any sort of flour you want to make, the Blendtec will do an awesome job of turning it to a fine powder. Update: The Vitamix has since released their “next generation” blender series which is a wider base. This is a great option for families. The 5200 Deluxe Complete Kitchen by Vitamix has a complete package that comes with three different containers, all used for different purposed. The Blendtec comes with an LCD display and has pre-programmable speeds. It works the blade at different speeds and different intervals depending on what you want, for example to crush ice, to make a puree or to make a smoothie. Blendtec claims that this is the reason it doesn’t need a tamper, because the variable speeds have a way of mixing thick consistencies, although I noticed that some times I still did have to open the lid and work my thicker concoctions with a spatula before continuing. These different settings also turn off automatically, so you can free your hands while using the Blendtec (although it still has a pulse and manual option). The Vitamix only has a manual option, but you can turn it on and free your hands if you need to. With both blenders, I almost always keep my hands on the container while it’s blending, so this was less of a concern for me. After using the automatic modes on the Blendtec, I found myself missing the easy-to-use controls on the Vitamix. I also really like the additional “high” speed that Vitamix has. 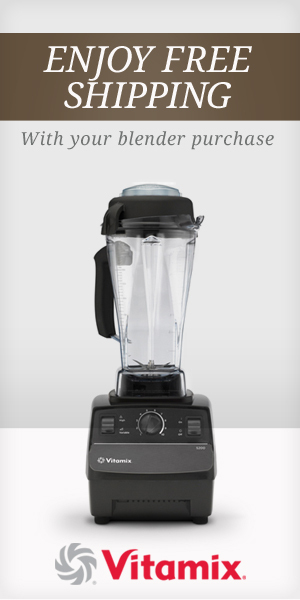 The Blendtec has a 2-blade system and the Vita-mix has a 4-blade system. I think this is why the Vitamix can make that nut pulp ultra fine when making milk, but the Blendtec does a relatively good job of this too. The 2-blade system allows you to clean the Blendtec easier as there’s a lot more room around the blade to collect the contents with a spatula or clean it with a scrub brush. Now that I also have the wider Vitamix container, that one is easier to clean than the one with the narrow base. One trick I use for quickly cleaning all my blenders is to add some warm water in it right after I’ve used it, put it back on the base and blend. This tends to do a great job of cleaning under the blade. The Vita-mix comes with a longer warranty. Vitamix has a 7 year warranty compared to 3 years for the Blendtec, although the blade for Blendtec is covered for life. The Blendtec does come with a stronger motor, so there is less likelihood of burn out. Update: Pricing is always a major factor. Both blenders offer quite a wide range. About 2 years ago, I spent several months using a very high-end Blendtec. After that experience I was leaning towards buying a Blendtec for my next purchase, I even recommended Blendtec to many people, with the motor strength being a key factor. However, since then, I went to my visit my mother and used her Blendtec for quite a while. (She went with Blendtec because I recommended it). I was pretty surprised that it wouldn’t fully blend my smoothies and got annoyed with the chunks in it. She spent about $400 on that Blentec. When I called my friend who had the Blendtec that I liked, I asked him which model it was and how much he paid for it, and he said it was top of the line and spent about $1300 on it! Comparing price points, I would rather spend $500 on a Vitamix than $400 on a Blendtec. Which Blender do I recommend: The Vitamix or the Blendtec? After everything I’ve seen with both of the blenders and having the opportunity to use them both quite extensively, I recommend the Vitamix. I like the 5200 Deluxe set, however they’ve also release the S30 for more personal use and of course, they have the classic getting started Vitamix which is also a great option. Unless something radically new takes the blender market by storm, I’m sticking with my trusted Vitamix. Want to learn how to make raw food on the beautiful islands of Hawaii? Check out our Raw Food Hawaii Retreats.